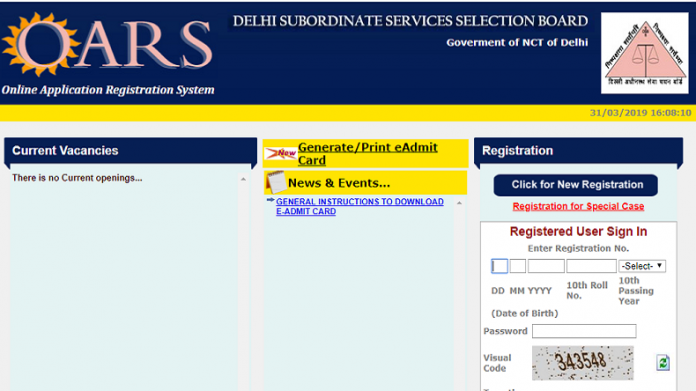 The Delhi Subordinate Services Selection Board (DSSSB) is all set to release the Admit cards or Hall Tickets for the upcoming recruitment examination soon @ on the official website – delhi.gov.in. All those who have submitted their applications for appearing in the examination are advised to keep an eye on the official website and download DSSSB Admit Card 2019 for the examination with the help of the instructions given below. Candidates must note that admit cards will be available for download once published by the authority. Candidates will have to keep their Application No and DOB handy to access the admit card. The recruitment examination is being conducted by the authority for the posts of Lower Division Clerk, Stenographer, Jr Lab Asst, Scientific Assistant, Welfare Officer/ Probation Officer/Prison Welfare Officer, and Legal Assistant. Candidates can visit the website of DSSSB for more details regarding the vacancies of the above-mentioned posts. How to Download DSSSB Admit Card 2019? Download the same and take a print out of the DSSSB Admit Card 2019 for future reference.